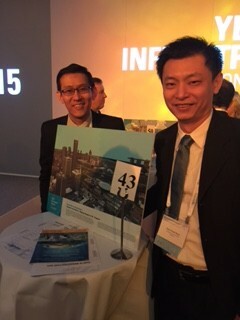 At the Bentley Year In Infrastructure 2015 Conference held in London a week ago, it was noted that GIS was an integrated part of Bentley’s offerings, particularly in the utilities and assets areas of the products offerings. Products are being rolled into CONNECT Editions, which will allow users to leverage cloud services through a common modeling environment platform. 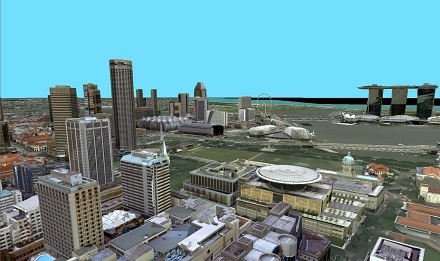 Other products such as Bentley’s OpenUtilities, leverage GIS and their ContextCapture is being used to obtain a high resolution and georeferenced model of cities and even countries. Bhupinder Singh, Senior vice president at Bentley Systems, talked about how the cloud is the avenue by which we achieve convergence. And convergence is seen in the implementation of new CONNECT Edition products, those products that converge with others. All the CONNECT Edition products leverage cloud services. All CONNECT Edition products are underpinned with development and delivery through a platform of a common modeling environment. MicroStation CONNECT Edition contains brand new modeling. ProjectWise is being used by 2/3 of organizations today. In ProjectWise CONNECT Edition, cloud services, transmittals, RFIS have been added, and users can securely drop design content into the supply chain without the need for another cloud service such as DropBox. I-models, a way of packaging content, have become commonly used and discussed, leveraging Bentley application content and non- content. Navigator CONNECT Edition offers desktop to field connectivity as well as field information captured can be resolved through workflows with cloud services. Structural Navigator CONNECT Edition is also available on the phone. Now larger screen models are very capable of displaying these applications in the field. Other CONNECT products introduced include SACS and Moses. All Bentley analysis contains some sort of Wizard and Scenario Services is no exception. When you have a lot of computing power, you generate a lot of data and analysis results. Scenario Services will help find the most meaningful data by mixing numerical and graphical displays. 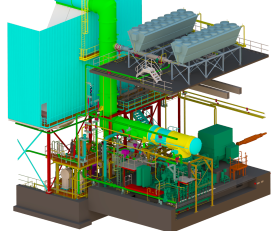 It has been demonstrated with piping systems and pipe support optimization, structural with structural infographics and doing comparisons, allow for combining indicators and weighted combinations with great visualizations. It can be used with GenerativeComponents, Bentley’s generative design software, and you can use other cloud services such as Microsoft Azure with it as well. There are many advancements for government users, such as 3D visualization, 3D mapping, 3D Cities and 3D for building information modeling. The agency Blom has chosen ContextCaputure to be used in Stockholm to counsel citizens about the city. It is used on large touch tables, and will soon be available on the web. It can be used in all 3D GIS formats needed by clients. Accuracy is somewhat dependent on accurate ground control points, yet the same is true with other imagery. You can use low or high resolution imagery. The accuracy will depend on what you choose to put in. The next version of ContentCapture will have more tools for those who are not photogrammatrists. Coastal erosion is encroaching into roadways and houses in Onkaparinga, on the southern fringe of Adelaide, South Australia. They wanted to model the 30 km coastline, and took a number ground points, and photos. They created a really accurate model, so they can look at change management and analyze the coastline over the years. This way they can make sure they can improve their safety. Western Power empowers 3,000+ workers in the field. Field crews needed access to up to date network data, quickly. They make thousands of changes per month, and no one has to come into the office now that they are using Bentley Map Mobile. This gives them access to large datasets on the tablet with or without an internet connection, and leverages a GPS interface. Large datasets can be downloaded to the device so the worker can be offline, get them updates every day, and they only receive the updates rather than entire files. The product Bentley OpenUtilities has been used in beta at Western Power. OpenUtilities represents all utilities and serves as the GIS enterprise for organization and design, or it can serve as a design tool for another GIS. It does design, cost estimating, and managing network information. AssetWise ECM allows for managing performance with built-in reliability, and looking to extend the life of aging assets with analyst reporting on reliability and APM, with proof that assets can be reliable to operate over time. Leverage industrial internet of things. 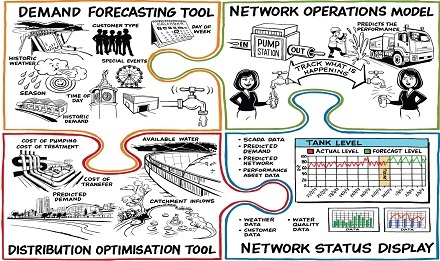 South Australia Water had forecasted a demand and optimized use for a AUD $400M network upgrade. They created whole set of decision support tools as well as 7-day asset registry, looking at predicting demand in this area. They are able to save AUD $3 million in electricity, reduced operational expenses by AUD $400K and had better and faster decision support, and improved visibility into demand with using AssetWise Amulet. Predictive analytics in Amulet is bridging IT, OT, and ET (information, operational and engineering technology). Proof of concept of R integration. Integration of hydraulic modeling with SCADA improves decision making by giving users information on the model where there aren’t sensors, and it can also predict what might happen next in the system. WaterGEMS added the ability for users to add SCADA information – what happens if there is a fire, or what happens if there is a break in the system? Bentley is not only making tools easy to use, and use-case easy, but also providing the results of hydraulic information and benefits from “optioneering,” but within the environment users are regularly using so users don’t have to learn to use another solution. Reduces costs and improves service. New sewer and stormwater offerings advance quality and productivity integrated into one product. These were separate and distinct processes. By integrating them users get to see the results of hydraulic analysis and subsurface pipes, that often have tight corridors. Storm systems are gravity fed systems and it is usually necessary to work with the utilities that are present. This entry was posted on Friday, November 13th, 2015 at 7:59 am. You can follow any responses to this entry through the RSS 2.0 feed. You can leave a response, or trackback from your own site.